Here are some photos of quilts and tops made by my workshop students, or sent to me by other quilters. I always love to see interesting variations on my designs! 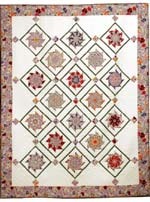 Barbara Teevan of Downey CA began this quilt in Bethany's "Mystery Stack-n-Whack®" class at the 2004 Glendale Quilt Show. The mystery has since been revealed- the pattern is the Counterpoint Star design from 3 Quilters Celebrate the 4 Seasons. 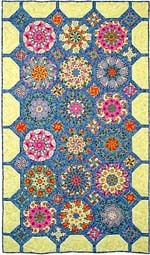 Barbara's quilt was machine quilted by Jan Stupin of Cerritos, CA. 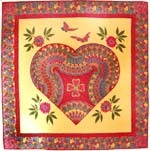 Jo Ann Cooper of Spotsylvania, VA designed this wonderful heart quilt using 15 Degree fan wedges. Debbie Geissler writes, "I had to come up with a challenge quilt for our guild and this vegetable fabric screamed for Stack-n-Whack. Some of my friends think, that's all I do. We were given a fat quarter of the the purple and green fabric and our theme had to have something to do with food ...the other veggies were paper pieced. It's 36" x 36". " 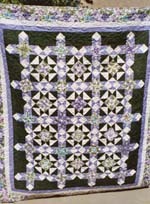 Debbie was a winner in the AQS Contest in 2002- click here to see that quilt! Sally Bramald of England made this quilt for a raffle to benefit Feed the Children UK. The raffle raised over $6000. Sally says, "The quilt was inspired by Marie D Webster's Sunflower quilt which she designed in the 1920's. She made the sunflowers form a rectangle in the middle, I made mine into an oval and the butterflies were just for fun. It's about 60" x 80". The flowers and leaves have heavy machine trapunto." Judy Rich of Cincinnati, Ohio made this lovely pinwheel quilt in a framed setting. It was displayed in the special Stack-n-Whack® exhibit at the Sew Near to my Heart show, Feb. 2003. Carol Stanley of Fairfax, VT began this quilt in a Secret Stairways workshop at North Country Quilt Camp. She was making it for an orthodontist friend. He loves it! Helle-May Cheney of Plainfield, IL sent this photo of the Venetian Tiles quilt she is making for her mother. This is her fourth quilt, and her second Stack-n-Whack project. The full-view page includes a photo of the fabric. This adaptation of the Venetian Tiles design in Stack-n-Whackier Quilts is Mary Ellen Roach's second (!) quilting project. She plans to make three more, so that she can have one for each season. 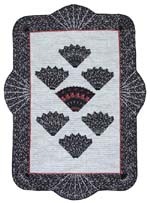 Jo Ann Cooper took my Fans class at Quilt University and designed this original setting. Little fish swim between and over the fans! 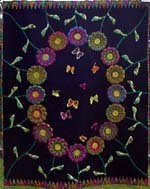 Dottie Lankard of Parsons, KS added a lovely applique border to her butterflies. Dottie also made this fan quilt with lattice setting. A unique variation on the Butterflies quilt by Kathy Costall of Perth, Western Australia. Kathy is a professional long arm quilter. 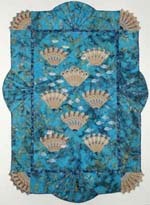 She has many other wonderful quilts at her website. MarjeRhine made this pinwheel quilt from an especially odd fabric. Click below for a full view and Marje's story. Jo Ann Cooper couldn't stop at just one fan quilt! She says, "This quilt is my tribute to all those naturally charismatic people who are the center of attention, no matter what situation they are placed in. The Scarlett O'Hara's of the world..."